Weather: the coldest main city in Peru. Relative hot in April-Oct, sunny in day, cold at night. Nov-March, rain season and cold (sometimes below 0�C at night). Average temperature all year is 7�C. The nearby lake of Titicaca attracted in the pre-ceramic period nomads living from fish and meat. Original cave paintings are found in the neighborhood. 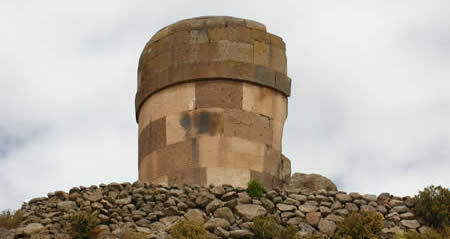 The impressive grave towers of the Kolla-culture in Sillustani are the concrete remains of this period. 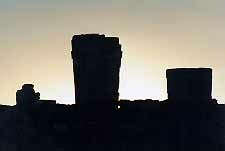 Later on was the region of Puno and the Titicaca Lake the scenery of important cultures like the Pucara and Tiahuanco. According to the legend Titicaca is the birthplace of Inca Manco Capac and his consort and sister Mama Occla. They raised out of the water with the divine assignment to establish an empire and unite the different cultures in the name of peace and civilization. The Incas incorporated the region of Titicaca and the Kolla-culture under Inca Mayta Capac to the empire of Tawantinsuyu and became part of the region of Kollasuyu. The importance of this Suyu into the empire was especially the presence of gold and silver mines, the breeding of alpacas and lamas for wool and meat and the cultivation of altitude plants as potatoes, quinoa and coffee. the Titicaca lake tour is the most gorgeous and unique lake in the world, because it's the highest navigable lake in the world at 3812 m.a.s.l. When the Inca Empire came to an end, the Dominican priest Fray Tom�s San Mart�n arrived in 1534 to convert the Indians in Catholics and to establish new settlements on the ruins left by the conquistadors. The Dominican, the Franciscan and Jesuit priests built many churches at the shores of the Titicaca. The dedication of the Indians in building the churches made this religious place a pearl of architecture and art. Especially a little place called Juli is known for its 8 churches. we have the best promotional travel packages for you to enjoy an unforgettable holiday. Besides the religious pre-hispanic evolution became the rivalry between the mutinous and faithful Spanish soldiers that left a sad part in the story about the development of the region. Separatist made a hard life for the viceroy of Peru and the local people. Their interests were the gold and silver mines. The Salcedo brothers Jos� and Gaspar discovered the gold mine of Layakakota and became in short time the richest men of Latin America. In 1657 they founded a city called San Juan Bautista de Puno. Next to the gold mine arose the city of San Luis de Alva and grew with 10.000 inhabitants bigger than Puno. Fighting between Spanish separatists flared up to capture the gold mines. 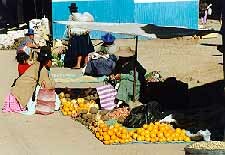 In 1661 began in La Paz an Indian revolt and many cities and villages, included the gold mines, were plundered what lead to an absolute chaos. The viceroy Conde de Lemos conquered all fighting camps, executed Jos� Salcedo and burned San Luis de Alva. From this moment on Puno was the most important city of the region. The gold mine of Laykakota is still closed and a local legend tells that nobody exactly knows where the gold mines are situated. The period of peace was over in 1781 when Indian revolutions fought for independence, as for example the revolt of Tupac Katari. In the war of independence in the beginning of the 19th century was Puno an important connection city between the freedom fighters of Peru and R�o de la Plata in Buenas Aires. After the independence in 1821 was Puno the scene of battle between Peru and Bolivia. When the Bolivians won the battle of Ingavi, they occupied parts of Peru until Tacna and Moquegua. The convention of 1847 neutralized the victory of the Bolivians and Puno and its region could finally live in peace. Steamboats were transported from Arica at the frontier with Chili to the lake Titicaca. 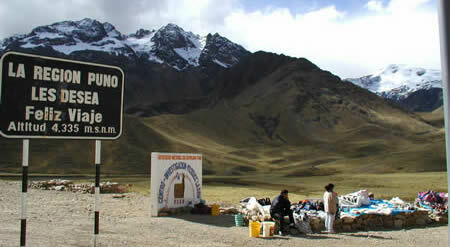 Mules carried the parts over the Andes and a railroad connection was constructed between Arequipa and Mullendo increasing the importance of Puno as a harbor. Bolivia exported lots of their minerals and ore with the steamboats on the Titicaca. These boats were used until 1982 for transporting goods and passengers. Puno is a touristic place thanks to the nearby Titicaca Lake and Sullistani. The city itself isn't very interesting and looks poor. Most of the buildings are made of adobe and covered with metal roofs. The center is small. The Jir�n Lima is a car free street with restaurants and pubs. This street is the center of nightlife and many tourists and locals come together in this place. Pe�as with life music create a pleasant atmosphere. One end of this street is the Plaza de Armas with the Catedr�l built in 1747 by Sim�n de Asta. In the Avenida la Torre is the railway station situated and a market of vegetables and fruits. In the small tiny streets of Puno a lot of bicycles are used for transportation. As these are also used as taxi, they bring visitors to the harbor at the end of Avenida el Puerto and Avenida Titicaca. Boat trips are offered with a guide to the floating islands of the Urus and to the islands of Taquile and Amantan�. Puno is the city of folclore, music and dance. In no other place in Peru so many different dances are practised as in Puno. In "la Fiesta de la Virgin de Candelaria" in the first week of February 70 local groups show their dances. She became the guardian angel of the city because of a miracle happened in the 16th century. The rebellious Kollavino Indians attacted the city and a army of Spanish soldiers showed up out of nothing. The Indians surrendered and scared away. The apotheosis of the festival is the 12th of Febrary when hundreds of groups pay their respect to dance in a long procession through the city, accompanied by the typical music of the Andes. In and around Puno more than 300 dances stood the test of time and are still practised. When the Incas extended their imperium, espacially under the great Inca Pachacuti, the Indians living on the shores of the lake Titicaca withdrawed on the Titicaca. The main vegetation is the Totora reed. With this they builded their floating islands. The Incas left them alone and centuries later untill now they still live on their islands. They live from fishing and recently from the sales of souvenirs to tourists. Our Peru Travel Package is unique and it has everything you need! hi averybody,about of titicaca lake,I\'m just here 4 days and can tell you that It\'s strinking and beautiful,I like it!!! I was surprised by the history of incas\' life,I didn\'t know about it,I visited Sillustani and it\'s great,so I\'m going to visit all the turistic place ,I hope so. Hi,Im travelling to Peru in July to do the Inca trail.I have 3 weeks.What are the other main things I should do or see? hi first tell me what place did you already see?. If you are interested about the miths of the creation of the Lake Titicaca, you should read about the Tiahuanacu's history. As far as I had been told when I was young is that the Lake Titicaca was form after the entire World was burried under water ( see the Christian religion's version). The residing Waters were acumulated in that Valle asumibly that is where the thriving Tiahuanacu's Culture existed, the Kollas etc. Some underwater expeditions are claiming that this mith may be a reality. They have seen stone walls similar to the Inca's ( the Incas imitaded the Tiahuanacu's biulding techiniques) perhaps the Flad really happened as it is said in the Bible and as it is said in the mith. hi,I'm in Puno now,then what do you want to know? tell me ok, I can send you an email if you like about of titicaca lake ok. I'm a student in Bristol, UK and I'm interested in legends and myths that pre-date or that have not been influenced by christianity. I have been told of a story about the creation of Lake Titicaca and wonder if anyone can point me in the direction of any other stories relating to its creation.